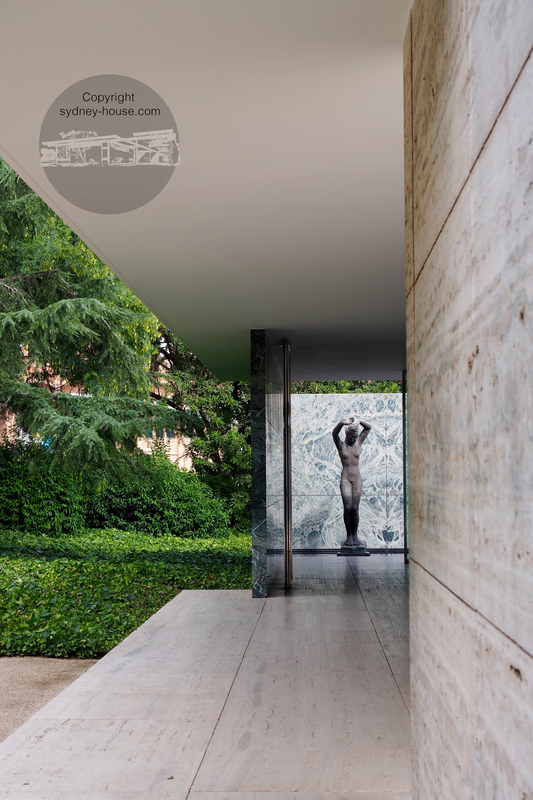 Travel inspiration: Barcelona Pavillion | Sydney House. Over the years we’ve been fortunate enough to travel to a few places that have offered us lots of design inspiration. In the middle of our design process, we travelled abroad for work purposes and managed to visit the beautiful Barcelona Pavilion in Spain, the new Australian Pavilion at the Venice Bienale, and the Milan World Expo. 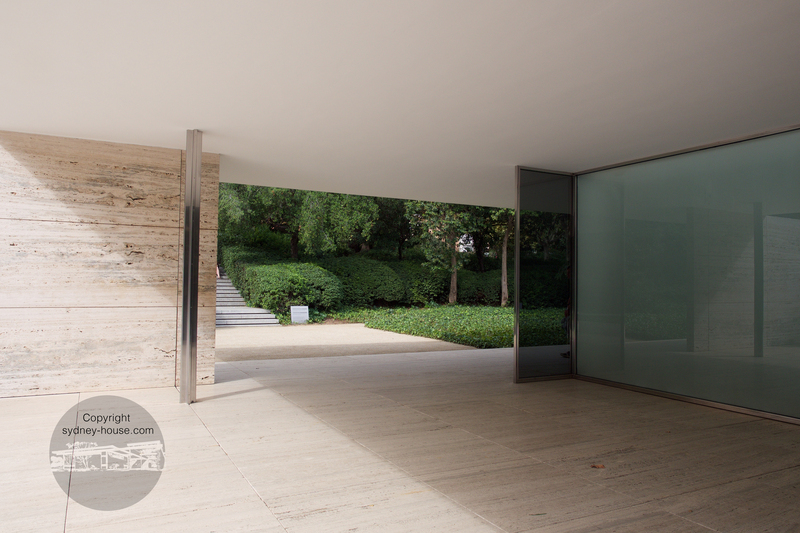 The Barcelona Pavilion (Pabellón Alemán) was originally the German Pavilion designed by Mies van der Rohe for the 1929 International Exposition, held in Barcelona. Locals also call it El Pabellón de Barcelona and you really have to ‘roll’ your Rrrrsss if you want to get there in a taxi. The building standing there today is in fact a stunning re-build of the original and it’s located in the Sants-Montjuïc area of the city which is full of great museums including the old palace and Museu Nacional d’Art de Catalunya, the Fundació Joan Miró museum. So much beauty in one place! The Pavilion itself is an exercise in restraint. Or what Mies van der Rohe made famous: Less is More. And it really is elegant. It’s hard to believe something so now, and so timeless, was conceived as far back as 1929 when materials were significantly limited. It is built from glass, steel and four types of marble, but apart from that – nothing more. At the time the Pavilion was reportedly conceived for the official reception of King Alfonso XIII of Spain and German officials. For me, the simplicity and the quietness of the space is what struck me most. A sort of peace could be found in a quiet corner and the vistas through to the reflective pools and the ivy-covered garden were probably my favourite aspects. 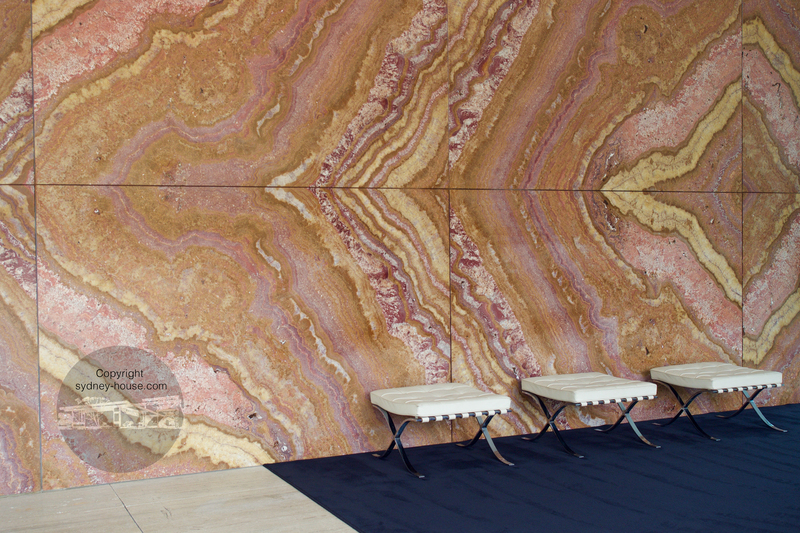 Marble featured includes Roman travertine floors, green Alpine marble and ancient green marble in the courtyard and golden onyx shown here from the Atlas mountains. 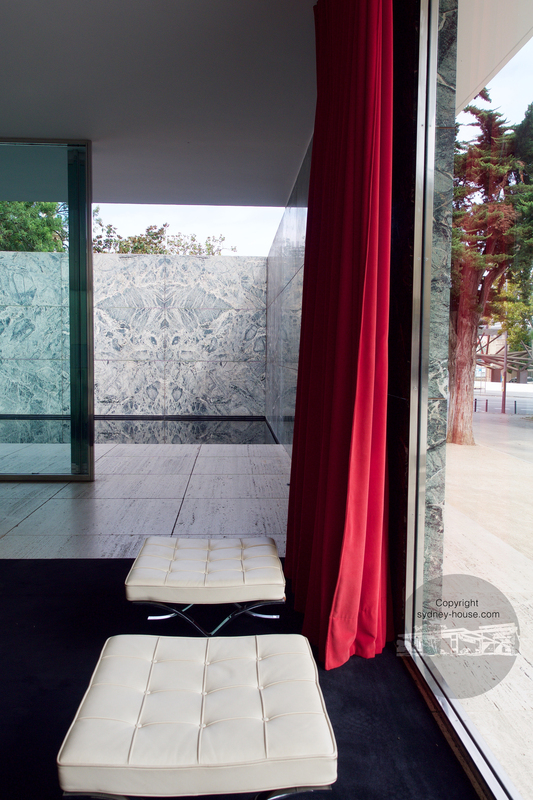 The now-famed Barcelona chair was also designed by Mies for the Pavilion. The leather-upholstered metallic profile is still an icon of modern design and is still made, and copied today. It’s shown in white leather along with foot rests. The view to the courtyard reflective pool and green marble, with Barcelona chair foot rests in the foreground, black carpet and red curtains. The travertine floors and walls flow out to two reflecting pools at either end: one pebble pool and a reflective pool featuring Georg Kolbe’s “Dawn” sculpture reproduction. Made from bronze, the sculpture is reflected in the water and in the marble and glass, making you think that it is sitting in multiple places. Curves contrast with the geometry of the space. Visiting this special place was a joy. A lowline building with a flat roof, elegantly paired back in materials and a bursting garden with ivy, Himalayan Pine, pebbles, and gravel also connected us back to our own little house in Sydney which has similar garden elements and geometry.